Conveniently located next door to Commonfolk Coffee and The Snake Hole Gallery and Studio – The Nook is a factory in the Mornington industrial precinct that has been transformed into a creative hub. There are studio spaces for lease and a large gallery space and meeting room / workshop for hire. The studio spaces are ideal for designers/makers to start or expand their creative small business or studio space. The space also serves as a platform for collaboration and networking, drawing on multiple talents and skills. If you are an artist, jewellery designer, fashion designer, photographer, graphic designer or the like, please get in contact for more information or apply now by filling out the form on our contact page. Please see our Gallery & Studios page if you would like to be added to our studio waiting list. The factory has been transformed into something fresh and new. The appearance of the entire space has been designed to be both appealing to the eye and yet very practical for multiple purposes. The overall look is industrial with a friendly feel – using mixed materials to give texture. Plywood, exposed bricks, painted bricks, white subway tiles, concrete, black metal are some of the materials we've used. We have large industrial pendants going throughout and an impressive modern table in the meeting room with glass pendant lighting for a more formal feel. 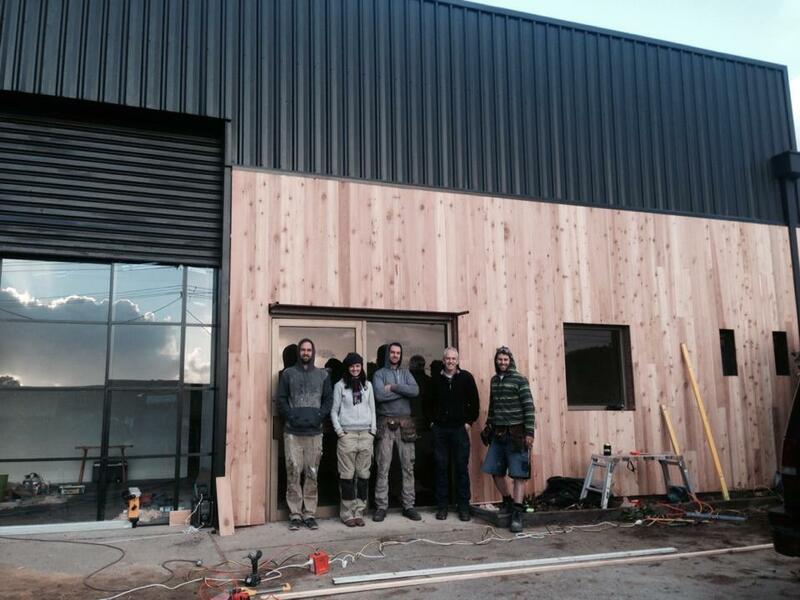 The exterior of the building has been cladded with cedar, mixed with black metal. The roller door opens up to large black metal framed doors and windows, filling the gallery with natural light. Kristy, Josh and Joel are siblings who have grown up on the Mornington Peninsula and all still live locally. Kristy is a Graphic Designer who's been in the industry for over 10 years. Josh is also a Graphic Designer and Illustrator who runs The Snake Hole Studio and Gallery (situated to the rear of The Nook). Joel is a chippy – with an eye for detail. Together we came up with vision for The Nook. A place creatives could come together to work alongside like-minded people. This is something that the Mornington Peninsula lacks – which is surprising, as there is so much creative talent around and little space available!